So you’ve decided to bring in a graphic recorder to support your team to be more focused, creative, collaborative and engaged? High five to you! You’re making an investment that will not only elevate the group during the meeting or event, but can also have long-lasting positive impacts. Here are some tips I’ve compiled from working with my wonderful clients over the past 5+ years that can help you get the most out of working with a graphic recorder. 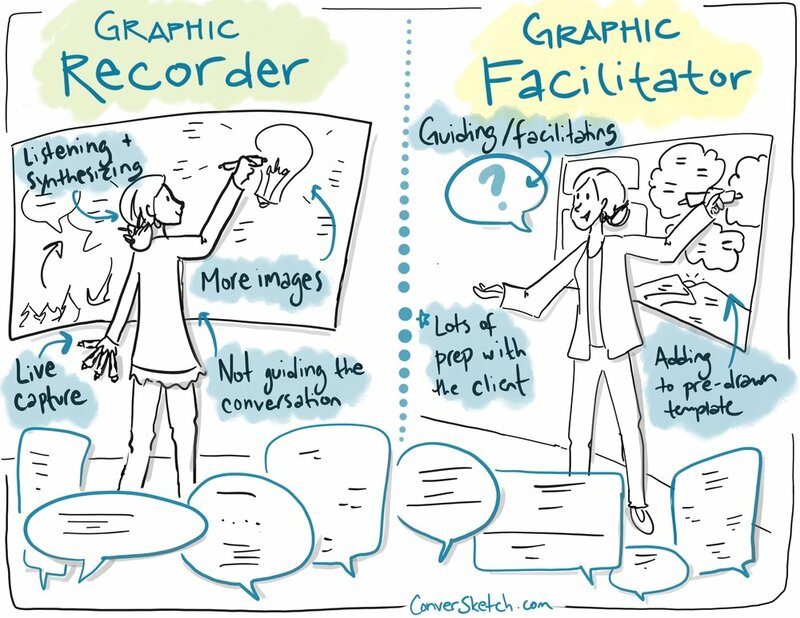 Graphic recorders know when and where they can be most useful for the group, or the kind of visuals that a group might need to do their best work. Bringing in a graphic recorder while you’re still developing the agenda means they can help you know the best places for them to fit in. It’s important we know your goals for the event so we can make sure our visuals help the group move in the right direction. We want to be helpful and supportive to your planning and facilitation team, so making sure we know the right people to figure out logistics and how to collaborate with the facilitator(s) can be powerful. When planning ahead, it’s fantastic to have ideas of how you envision a graphic recorder working with your team to help your group. It is also great to come in with an open mind; brainstorming with your graphic recorder might lead you both to realizing they can do something you never dreamed of before! Whether the recorder is working large-scale on paper or digitally on a tablet, make sure they can be seen. Setting them up at the front of the room with decent lighting (one time while working in a theater the lights went down and at that moment I was glad I keep a headlamp in my purse) and/or projecting their work on screens enables participants to see what they’re doing. Building in time for folks to walk up and check out what the recorder is working on, or for them to walk the group through what they’ve created is also a quick and powerful tool to help people make connections and see the big picture. This is often where people get stuck. The graphic recorder rocked out during the event, people loved it, shared it on social media, and…went home. How can you keep people looped in and excited about what they did or learned at your event? Before you even have the meeting, working with your graphic recorder to develop a long-term engagement strategy leveraging the graphics can unlock the key to momentum and keeping the group moving forward. Work with your graphic recorder to think about what your engagement strategy is after the event and how can the charts created can be used to help you and your people into the future. For more ideas and tips, be sure to check out this article from the fantastic team over at ImageThink. How can we make the most of working together? ...and right now I'm getting ready to head to Colorado State University for two days at the AgInnovation Summit!